The ACT Greens have announced that they will be pushing for a concerted effort by the ACT Government to develop a proposal for light rail routes in the ACT that can be presented to Infrastructure Australia, and that can be pursued without Commonwealth Government assistance. This is the lead item in three pronged transport proposal from the Greens that includes support for the mooted high speed rail linking East coast capitals, and also developing rail transport infrastructure in Fyshwick that would attract freight from road to rail. “Light rail, high speed rail, and an increased proportion of rail freight would bring significant benefits to the ACT region – including economic, social, environmental and travel benefits. These are the services Canberra deserves. 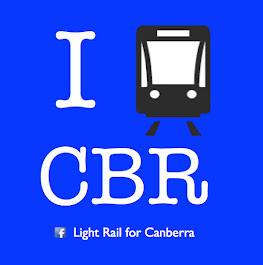 “Rail needs a champion in Canberra. The Chief Minister has lobbied and pushed for new freeways. Sustainable transport projects like light rail and high speed rail should receive the same effort. The Greens will be presenting legislation to the Assembly this week in support of this proposal. Since the initial announcement of the Infrastructure Australia bids several years ago, the focus on Light Rail - at least in terms of concrete support from the ACT Government -has waned, despite overwhelming public support. While much effort was put into securing funding for the Majura Parkway, little effort has been made by the ACT government into securing funding for light rail. The main element missing from the ACT bid to Infrastructure Australia for funding, was a 'shovel ready' proposal. This proposal by the Greens, will ask for that work to be undertaken - so that a revised bid can be made to Infrastructure Australia. It will be interesting to watch this greens proposal and the reaction from the Assembly this week.